You have not experienced Jamaica until you've experienced the Blue mountains. Breathtakingly peaceful, tranquil, mostly untouched and virgin, where the wind whistles through eucalyptus trees and whispy mists embrace the mountains and the valleys. The Blue Mountain Peak trail, is moderately strenuous and can be dangerously slippery in places. The trails climb through the western and mid portions of the Blue Mountain and John Crowe National Park to Jamaica's highest peak. It should only be attempted if you do not mind hiking through the jungle in the middle of the night. Wildlife is not a concern, but the steep ledges, slippery rocks, fallen trees and endless hazards make the trip dangerous in places. Very few residents of the island have made the trek, so finding a guide may be challenging. Trails to Blue Mountain Peak can be found from Kingston, the capital of the island in the south or from Port Antonio, in the north. The Kingston approach is much more common and is recommended. The Port Anotio trails are lesser known. Get a bus or a taxi to Mavis bank, from the town of Papine, which is located at the end of Old Hope Road in Kingston. The roads are relatively good from Papine to Gordon Town, then it gets get bad from there to Mavis bank, located in the Yallahs River Valley, and the home of the Blue Mountain coffee factories. The entire trip from Papine to Mavis bank is about 50 mins. Mavis Bank is typically where you would meet your guide and is where, when we were kids, we would start our hiking to the peak. We would arrive at Mavis Bank around 8pm and hike through the night. The recommended method is to start the trek 5 miles further up the moutain at the trailhead by Penlyne Castle, near Abbey Green Coffee Plantation that sits at 4500 feet. This requires arranging a ride. There are a few hostels such as Whifield Hall and Wildflower Lodge that can assist with arranging transport. The road requires a 4-wheel drive vehicle, it is narrow, steep and winding. This part of the island is breathtakingly peaceful, mostly unexplored and virgin, where the wind whistles through eucalyptus trees and mists billow over the mountainside only to evaporate in the sun. The drive up takes you through Hagley Gap, a one-street village where provisions and a hot meal can be purchased. The trailhead at Penlyne Castle is the beginning of a service road for trucks and jeeps in the upper reaches of the coffee plantation. The hike to the Peak is approximately 8 miles and takes about 4 hours. My memories of being in this part of the mountains is magical, "... a sense of lonesomeness, a smallness in the context the stillness of the vast expanse of mountains and valleys... a synchrony with nature like you've never felt". This road is wide but steep and leads to a section called Jacob's Ladder, which is only a mile long, takes about an hour and is the steepest part of the entire hike to the peak. The trail leads to Portland Gap, which houses the only ranger station in the area. This is where many hikers set up camp. Wooden outhouses are available, and a there are cabins that can be rented for longer stays in the mountains. The Peak, is another 2 hours hike from this point across trails that become rocky which can be dangerous if its raining . There is a rocky lookout ledge about 1 hour from Portland gap, with panoramic vistas of Kingston. From this ledge its another hour to Lazy Man's peak, through rocky trails with sharp switchbacks. The true summit lies east of this point, and provides much more spectacular views of the surrounding mountains, Kingston, the Jamaican Jamaican coast and Cuba (if you're lucky). The hike back is usually done in daylight, you'll get the full experience of the views and awesomeness of the surrounding mountainside and trails. Whitfield Hall (Tel: 876-927-0986), Wildflower Lodge (Tel: 876-929-5394) and Pine Grove (Tel: 876-977-8009, Fax: 876-977-8001). Whitfield Hall offers budget bunk-style accommodations with shared bathrooms, no hot water, and a kitchen that is available for preparing your own meals. Rooms at Wildflower Lodge are small with sink, toilet and communal showers. There is no electricity or hot water. Meals are available on request. Pine Grove has individual bedrooms with en suite bathrooms, hot water and will prepare meals on request. All three will arrange to pick up guests at Mavis Bank near the end of the bus route or at Papine.Personal vehicles may be left safely at the Mavis Bank Police Station. The hike can optionally begin at Cedar Valley, or a shorter route from Cascade. The latter requires driving from Cedar Valley to Cascade and commencing the hike there. Follow the main road up hill to the Forest Reserve where you can optionally visit the Rasta farmers coffee farm, by continuing follow the road, or cut through the forest reserve and re-join the road higher up. The rest of the hike is easy to Old Tavern Coffee Estate and Hollywell National Park. The hike is very scenic, passing through small villages and offering vistas across the valleys and mountains. The hike starts beside the remains of the old coffee works at Clydesdale. 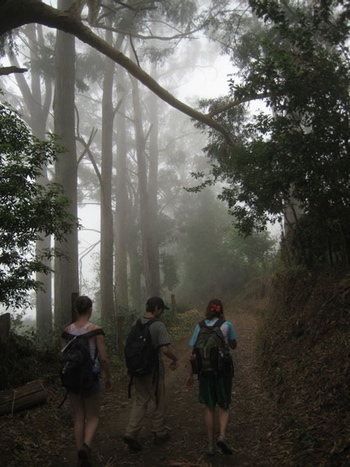 The trail, is steep in places and passes through coffee farms, small cultivations and banks of wild flowers to the 5,000 feet (approximately 1,500 metres) high Cinchona Botanical Gardens. Many exotic plant species adapted to cooler temperatures flourish there. From the gardens there is a striking view of the grand ridge of the Blue Mountains and in the distance Jamaica's southeast coastline. The hike takes about 1 - 1.5 hour one way and is fairly easy. From Cinchona, the Vinegar Hill Trail leads to Morces Gap, from which the North Coast is visible on a clear day. The mountains are often shrouded with shispy mists. This part of the trail is historic, as it is the oldest throughways in Jamaica. It is now shrouded by forest and rarely used. Mist soaked epiphytes, feathery ferns and dripping creepers flourish amongst the thick vegetation making it worth exploring. Maximum time for this hike there and back should be no more than 2 hours. Gordon town was once a staging post for horse, mule and donkey traffic plying between Kingston and the mountains. Several tracks that were were used to transport market produce from farming communities in the mountains, converge on the town. There are several hiking trails to choose from in Gordon Town, which is realtively easy to get to from Kingston, by bus or taxi. The trails predate the present roads and were once well worn thoroughfares to Newcastle, Content Gap, Constitution Hill and Flamstead, that sits 4,000 feet above sea and an important naval lookout point for Port Royal. Today, its offers scenic view that attracts visitors. The Bermuda Mount Trail, provide excellent views of Gordon Town and the surrounding hills. It starts a short distance above the Gordon Town post office and climbs between small holdings and fruit forest to meet the main road to Newcastle at Craigton. This stretch takes less than an hour. This trail is a well used parochial road. Some of the infrastructure predates the military camp at Newcastle. 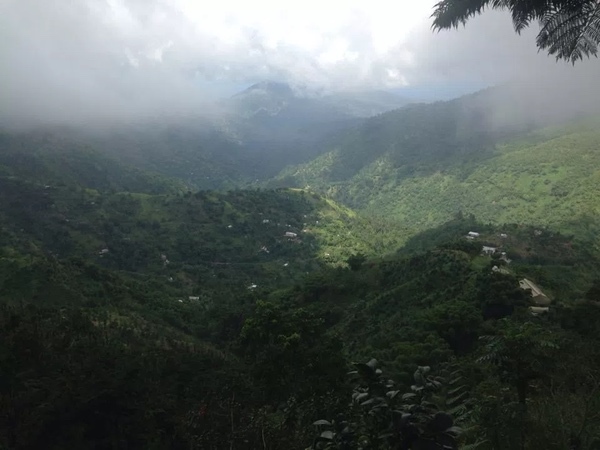 It is longer than the Bermuda Mount trail and passes through small communities and coffee farms with the Hope River plunging over boulders below. The trail crosses the river at several points via foot bridges, with spots of inviting pools and waterfalls. There are views of the military camp at Newcastle and the valley below. Allow 1 1/2 - 2 hours for the walk from Craigton. The Copper Gully Trail leads to to the residential small hamlet of Greenwich, netsled between Newcastle and the Holywell Nature Reserve. It starts from a from a bridge on the Newcastle road and steeply climbs up amongst ginger lilies to pine forest and then coffee farms. Just above Gordon Town the trail to Flamstead is very steep, narrow and takes about about 4 hours to complete, but the scenery is worth the challenge. The area was once heavily cultivated and a major route to the market, but today is mainly undeveloped and wild. There are spectacular views of the ocean and the mountains. Flamstead is a historic strategic nval look out point, overlooking Port Royal. There is the remains of a Great house and a private museum. This hike requires stamina, fitness and is only recommended for regular hikers. Hikers should take plenty of water. Flamstead is also accessible by 4-wheel drive vehicles and is a great location for a picnic. The 300-year-old house at Bellevue was once owned by a former Governor. 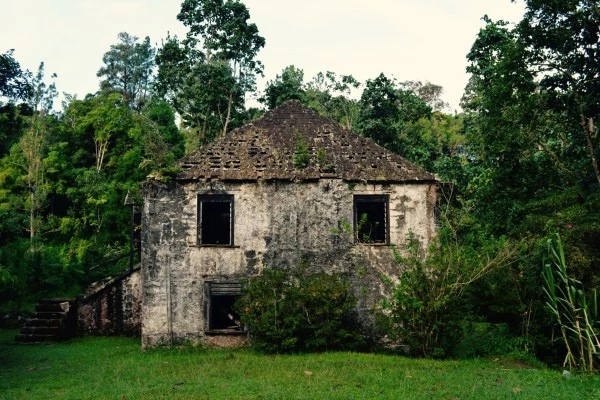 It is now owned by the University of the West Indies and is accessed via a steep road through coffee and eucalyptus farms. TThe drive from Papine takes 40-45 minutes. From Bellevue it takes 1/2 hour to hike through through eucalyptus trees and ferns to Governor's Bench and Mount Rosanna located at an altitude of 4000 ft, with sweeping panoramic views of the Palisadoes, Port Royal and the Cays. This trail is good for birdwatching and descends steeply to Lime Tree and then to Tower Hill and on to the Mavis Bank Coffee Factory. The hike from Bellevue to the factory takes about 2 1/2 hours. This trail leads to leads to Content Gap and starts above the old staging post of Gordon Town. The path is steep in places, crisscrossing a tributary of the Hope River. There is evidence of the trail's former importance, in particular a quaint stone bridge. The trail has some good views of the Kingston harbor especially at the top near Content Gap, which is also accessible via vehicle. The beginning of the trail is challenging but the most of the walk is fairly easy. It takes 1 1/2 tp 2 hours. This hike can be approached from Hordley Cross, St. Thomas. There is a scenic drive from there to Haining, located on the St. Thomas and Portland border, where the walk starts. The road climbs through limestone embankments of forest, small holdings and coconut groves. From Haining to Packi river there is a picturesque limestone road crossed by several streams and bordered by trees. Damp conditions encourage thick plant growth. It takes approximately 1 hour to walk to the water catchment at Packi river.